Rivera Venus 5 Amp Head Review – Best Class-A, 2-Channel Guitar Amplifier? While we typically focus on pedal reviews at Best Guitar Effects, I wanted to break away from the norm to bring a particular amp to your attention: the Rivera Venus 5 head. Why is this amp important? For starters, this is the main amp I personally use when reviewing and testing pedals. While a pedal may sometimes be played through another amp, this is my personal go-to amp for great tone and coming to a final verdict on any guitar or pedal. It’s also the amp I’ve been using for our review demo YouTube videos as it provides an impeccable clean sound, an ideal foundation for using with effects pedals. I actually discovered this amp by accident while researching the Rivera Silent Sister and RockCrusher Recording (pictured above). But from the moment I heard the Venus 5, I fell in love. After a little more research, I was set on having the Venus 5 above all other amps. It’s now a staple of my Review Gear. I won’t call it perfect as there are a few minor areas of improvement that could be made. But seeing as this head really is a choice piece of gear from one of the best amp makers in the business, I figured it deserves a little more attention in a dedicated review. The Venus 5 is a 2-channel, Class-A, 35 watt, amplifier head that uses 5 12ax7 preamp tubes and 2 6L6 power amp tubes. Channel 1 does hot-rodded overdriven tones and searing leads. Channel 2 covers clean and overdriven sounds. Sounds simple enough, but there’s a little more to the story of why the Venus 5 is such a special amp. Let’s touch on some history before we dig in. Although Paul Rivera started Rivera R&D in the late 70’s, he’d soon go on to become a Marketing Director for Fender Amplifiers a few years later. There he oversaw the production of and co-designed what some guitarists regard as the last great Fender amps. Perhaps most notably of these Rivera-era gems was the Fender Super Champ, a little 1×10” 18-watt combo amp famous for its clean & dirty recording tones. Paul Rivera would eventually leave Fender and focus on Rivera Amplification, designing high-end boutique amplifiers for discerning musicians. 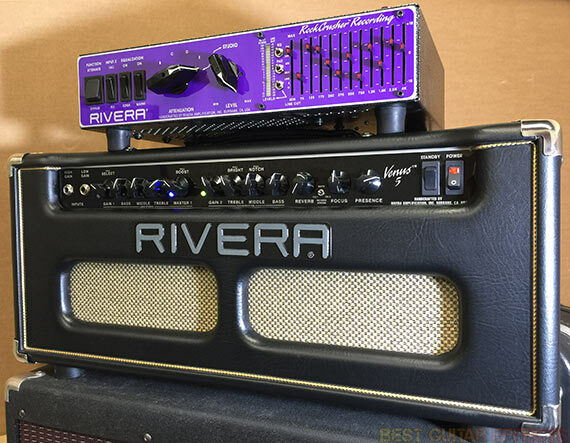 Rivera amps are known for their studio and stage ready performance, being among the most rock-solid and reliable pieces of audio equipment you’ll ever come across. Fortunately, they’re backed by great tone and playability that match their rugged durability. 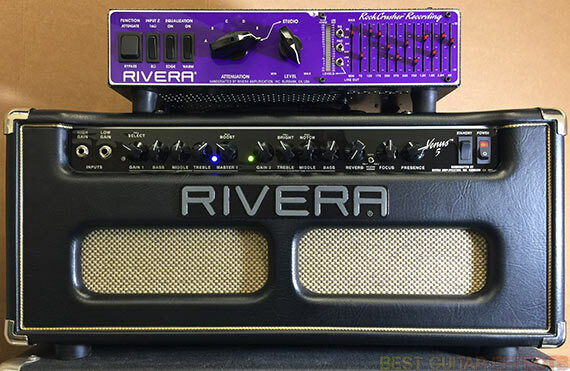 While the big corporate amp makers have continuously sought after ways to cut corners and make a “cheaper” product, Rivera Amplification always strives to make their gear “better” with an unwavering focus on quality in all areas. It’s for these reasons that this family-owned brand is still going strong today, ever victorious in their pursuit of quality, tone, performance, and innovation. I’m going to run down the features of this amp real quick. Then we’ll heat up the tubes in our Rivera Venus 5 head review to see if it’s the best class-A, 2-channel guitar amplifier around. Visit Rivera Amplification for more info about the Venus 5 amp head. And here’s Tim Pierce’s Venus 5 review demo that pretty much sold me on this amp. When it comes to creating amps that achieve classic Fender style clean tones, few people are as qualified as Paul Rivera to do so. But never a company to settle for what’s already been done before, Rivera Amplification have continuously reinterpreted guitar amplification with each release, including their Venus series. The Venus 5 is an amp that ventures into all the familiar “tweed” and “blackface” territory but has plenty of voices of its own. Yes, this is no mere Fender amp clone in any sense, but it can achieve those sounds and much more. I’m going to work backwards and start with Channel 2 as that’s where most of this amp’s tone magic is found. For now I’ll also be focusing on the Modern wattage setting which allows access to the amp’s full 35 watts. Like ye olde amps of yore, the Venus 5’s Channel 2 doesn’t have a separate Gain and Master knob, just a single Gain knob that acts as a Master Volume control. Using it from fully counterclockwise to around 10-11 o’clock gives you a range of beautiful clean tones with plenty of headroom and dimension. There’s also a real presence and punchy feel to the sound when you play firmly or dig into the strings. These remind me of the hallmark characteristics of the Fender Bassman, another 6L6 powered classic. But the Venus 5 has a somewhat more refined and sophisticated sound. While I previously regarded the Bassman as my all-time favorite clean/mild amp, that changed after I played the Venus 5. Yes, the Venus 5’s clean tones are impeccable, but Channel 2 has a few more surprises up its figurative sleeve. Once you roll the Gain up towards that 10-11 o’clock area, you may notice a little breakup when you really dig in, depending on how high your guitar pickup’s output is. You can do a few things here. Putting an overdrive pedal or clean boost in front of the Venus 5 will help you push the amp into overdrive. Or you can turn Channel 2’s Gain knob just a little higher until you hear the clean/dirty hybrid tone coming out. There’s a whole little area of sweet spots around here. The Venus 5 just has this beautiful breakup that is among the best I’ve heard. It’s really such a blast to play through which is why I just can’t seem to tire of playing through this amp head. If you want to crank the Gain even more, you can even get a full-on crunch sound that’s raunchy and just flat-out rocks. It’ll cover a range of clean sounds, classic rock tones, overdriven blues, and more. I don’t recommend pushing the Gain all the way. You don’t want to lose any clarity. If you need more distortion just put a boost or overdrive up front to find the saturation you need. This channel provides an excellent foundation for your pedals which I’m sure readers of this site will appreciate. The versatility and wide assortment of tones makes the Venus 5’s Channel 2 my personal favorite amp channel I’ve ever heard or played through. And I haven’t even talked about the tone controls yet. On Channel 2 you’ll see the standard Bass, Middle, and Treble control knobs here. The controls are musical and will generally sound good even when set at extreme values. Finding “wrong” settings may not be what you’re looking for, but the Venus 5’s Channel 2 just always seem to sound good in some sense. But as is usually the case, it’s best to start with the Tone controls at noon and work the knobs based on your needs. Their range of effect is smooth and doesn’t seem to clash with the others although they do work together to form a cohesive “whole” sound. Need to brighten up dark humbuckers? Boost a little Treble. Need to fatten up some single coils? Add a little Bass. Simple and effective. Channel 2’s Middle knob has an interesting surprise: a Pull Notch switch. Pulling the knob out shifts the mid frequency focus from 550 Hz to 250 Hz. Basically, this takes you from an early British or “tweed” style midrange to a classic “blackface” midrange. This is another big part of the Venus 5’s versatility and really helps you achieve amp tones similar to several of the classic clean and blues amps. The Treble knob also has a Pull Bright switch. While I generally find the range of highs sufficient as is, pulling the knob out adds some extra chime and sparkle, adding a heavenly sheen to your sound. This may prove useful with extra dark humbuckers or if you want a bright, top-end focused sound. Channel 1 is the Venus 5’s hot-rodded high-gain monster. Don’t get too scared if you prefer mild tones. There’s all manner of mild overdrive to be found if you just want to kick it up a little past Channel 2’s clean sound. But it’s this channel that also proves to be the biggest different between the Venus 5 and Venus 3 & 6. The Venus 5’s dirty channel is simply capable of more gain than her Venusian sisters. That, and the Venus 5 uses 6L6 power tubes instead of the 6V6 tubes found in the Venus 3 & 6. It’s also worth noting that the Venus 5’s Channel 1 is adding an additional 12ax7 preamp tube to the mix to provide the hefty gain boost over Channel 2. The Presence and Focus knobs provide some final little touches to your sound. The Presence is incorporated at the power amp section of the Venus 5 and gives you a way to add a final polish to your high-end. This can be set with a general emphasis on how you like the amp to respond, whether your guitar is a little too bright or dark, and in conjunction with the voicing of your amp cabinet’s speakers. The Focus knob specifically affects how the Venus 5 plays with your speakers, blending from “loose” to “tight”. This can be handy if you’re like me and want to tighten up the sound of Channel 1 while achieving maximum punchiness/tightness with Channel 2. Or you can “loosen” a closed-back cab to sound more open. It’s effects are subtle to my ears but still a helpful feature nonetheless. The Venus 5’s Effects Loop gives you a Send & Return between the pre-amp and power amp sections complete with dedicated Send & Return Level controls. This provides ultimate flexibility for patching in delay pedals and reverb pedals while letting you compensate for any variation in signal level. For a few of our review demos (Eventide TimeFactor, Empress Effects Vintage Modified Superdelay, Strymon El Capistan, etc. ), I recorded using the Venus 5’s Effects Loop. It’s very clean and arguably the best way to utilize delay/reverb effects according to many guitarists. A few more things to note, while the amp may not be quite as loud as, say, your average 50 watt combo, the Venus 5 still puts out enough volume to be heard in the mix when playing up to medium sized venues. It’s also in the nature of Class A amps to be louder than Class A/B amps of the same wattage, so you just might be quite surprised by its output if you do ever have the chance to hear it side-by-side with another 35-50 watt Class A/B amp. These days more and more guitarists are relying on miking and monitoring rather than high-wattage amps, so the wattage and loudness arguments are all but over for many. If you want to use the amp at lower volumes, the Venus 5’s Vintage mode essentially cuts the output to 15 watts. It does seem to add slightly to the vintage vibe of the sound while, according to Rivera, “enhancing the even order harmonics”. It’ll also still pack enough power at 15 watts to handle smaller gigs and make it ideal for low-level miking/recording. Venus 5 vs Venus 3 or 6? I won’t say that I’m necessarily rigid on my preferences for 6V6 or 6L6 tubes or even preamp voicings. It’s all about the cohesive whole and the myriad factors that define the final sound of an amp. There is the difference in power tubes to consider as well as Channel 1’s potential higher gain sounds. The Venus 6 & 3 have a little less available gain on tap. For me the Venus 5 just sounds amazing for clean sounds and lower/mid-gain overdrive tones. Add in a boost, overdrive, or ripping high-gain distortion guitar pedals (like the Rivera Metal Shaman), and you can get just about any sound you’re looking for. The Venus 5’s Channel 2 is the ultimate clean foundation channel for pedals. It’s important to consider the cabinet you play it through as well. Rivera sells extension cabs with several choices of speaker to suit your preference for either Celestion 70th Anniversary G12H-30’s, G12T-75’s, or Vintage 30’s. But I’m a little biased here as I’ve been forgoing cabinets altogether in favor of “direct” tones. I’ve been a fan of mixing cabinets and speakers from different brands ever since this time long ago when I was blown away after someone unplugged an Orange head from its branded cab and showed me the sound from a home-made cab with Jensen speakers. But I find myself sticking with Rivera when using the Venus 5. It’s all about the RockCrusher Recording, a transparent power attenuator with 11-band analog EQ for emulating the characteristics of famous speakers. See our Rivera RockCrusher Recording review and our YouTube review demo videos for both products to hear this combo for yourself. And like I said, this rig is what you’re hearing in all our newer pedal review videos. While I’d still like to see a few minor refinements to the Venus 5’s Channel 1 (more Mid-Freq flexibility & tighter, more focused higher gain distortion), it’s Channel 2 that makes this amp absolutely indispensable to me. That channel alone would make the Venus 5 my “desert island” guitar amplifier. You really must try it for yourself. All the videos and reviews can’t compare to the sound and feel of plugging in and playing it yourself. The Rivera Venus 5 amp head’s Channel 2 is one of the most impressive and versatile clean/overdrive channels I’ve ever heard. There’s also plenty of higher gain versatility thanks to Channel 1. The included Spring Reverb is also a real treat for the vintage tone lovers. There’s even a handy lower wattage Vintage mode for bedroom/practice/home-recording levels. Our readers will appreciate that Channel 2 provides one of the best foundations for use with pedals you’ll ever hear. The Effects Loop with Send & Return level knobs also add essential versatility for use with reverb and delay pedals. It’s not really about whether it’s the best Class-A or 2-Channel amp. The Venus 5 is one of the best guitar amps I’ve come across. That concludes our Rivera Venus 5 amp head review. Thanks for reading. Want to buy the Rivera Venus 5?